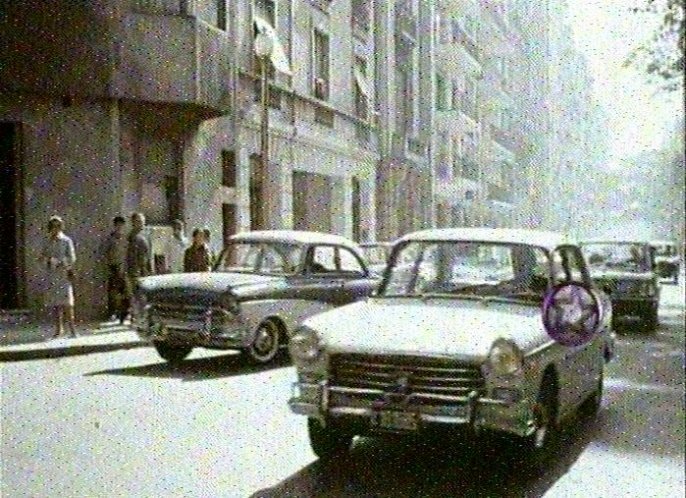 IMCDb.org: Peugeot 404 in "Sette uomini e un cervello, 1968"
Those reinforced bumpers were standart on Argentinian market. Even 2 CV and other light cars had to be addapted to suit a special law. In Brazil, there was no law about those extra over riders reinforcements, but many owners decided to install them (aftermarket)in order to avoid bigger damage. Nowadays this trend has passed. Taunus 17 M were also very rare in Brazil; they came to the market in the moment Brazil started auto industry and therefore some pretective laws came to force. EDIT: looks like the early 404 made here by IAFA... because just called Peugeot 404 (without any trim), even the plate it's for an early 1967 year (re registered). You can see in the Red Multicarga the old scheme of the plates in Argentina (six numbers). It is always very good to hear from you, even when you believe in some ownerness of countries, at least one. Concerning the reinforced bumpers, I would be very humbled to suggest you to procure laws in force during the sixties. You will find and the truth will be clear again. Maybe you are young enough to be so uninteressed, but youth shouldn't be an excuse to avoid accuracy. Anyway, I feel this is a free blog and your opinion will always be read. @gomsel - he's right - it is a free blog, and the rest of us are interested in opinions, without predjudice against where they come from or what flag is flying. Don't get yourself sent to the naughty corner again by creating non-existent fights out of nothing. why? i'm just interested in my opinions, my contributions & my country. Just all. Sorry, but i'm correct with the bumpers comment. Gomselmash11 wrote Sorry, but i'm correct with the bumpers comment. Perhaps you are. But let the discussion and sharing of knowledge unfold without attacking the people. Then we can all enjoy the process. ¡Basta ya!. Tu comportamiento es del todo punto intolerable. Esa persona simplemente ha hecho un comentario y tu le contestas (como a todos los brasileños) como al enemigo. Si quieres enemigos, este no es el lugar, ni nunca lo será. Tu te crees que no dándote la razón se ataca a todo lo argetino cuando lo único que se hace es reprender un compotamiento inadmisible entre personas civilizadas. Si crees que son el enemigo, tienes un problema. Tus comentarios hacía todo usuario brasileño, se diga en español, en inglés, en francés ó en chino es, pura y llanamente, xenófobo. I agree partially. I really don't feel I am treated as an enemy just by being from Brazil. In South America, to be against other boundary countries was a common feeling because there were lots of wars, as similar as between countries of other continents, but the common markets and diplomacy made those times gone for ever. The best of this neighboorhood unfriendship is that Brazil made complaints with many boundary countries - even going to war some times, but never against Argentina. Meanwhile, to be on the funny side of old times, Brazil built a strange railroad system, with a mixture of dimmensions to avoid easy invasion from neighboors, guess who? My feeling is that Gomsel still trying. Bob Dieck wrote Brazil built a strange railroad system, with a mixture of dimmensions to avoid easy invasion from neighboors, guess who? And thousands of manhole-covers weren't covering entryways to the sewerage, but, when the enemy-invasion would have ben come (as the enemy was always seen "The Russian", less the other Eastern Block countries), blasting charges.